Great accessories complete an outfit. And these super cute handmade accessories by Jen Merritt of Persephone's Awakening are just what I need to finish my look. 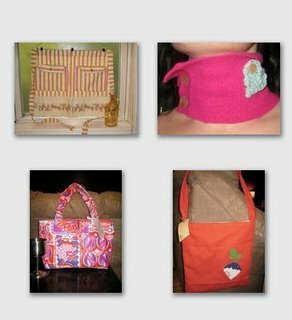 Most of the pieces in her collection, which include handbags, aprons and neckwarmers, are one-of-a-kind since the fabrics are collected from vintage and reclaimed clothing, fabric remnants, pillow cases, even duvet covers! Her use of fabrics, in totally unexpected color and texture combinations, are really fabulous. And I love the addition of the whimisical felt appliques and giant fabric colored buttons. Jen loves custom orders, so you can create your own handbag or apron from her collection of fabrics or send her a favorite of your own. Future plans include ipod cosies, tampon cases, and wallets in her signature fun fabrics. Check out her etsy store for ready made items or contact her about your own inspiration for your own custom item. With prices starting at only $10, you can afford to cross everyone off your holiday shopping list.